Wood fence installation can greatly improve the privacy of your home, garden, lawn or swimming pool. It may also enhance safety by preventing children or pets from leaving the yard. Some fences delineate property lines or protect buildings from thieves. Regardless of its purpose, wooden fencing typically has a desirable appearance and sturdy construction. Due to the difficulty and complexity of this project, many homeowners hire contractors to perform wood fence installation. These professionals dig holes, pour concrete, attach rails to posts and complete several other vital tasks. Installation involves considerable labor and material expenses. On average, professionals charge around $825 for their efforts. Materials, supplies, and tools add approximately $2,100 to the total cost to install a wood fence. Among other things, contractors must purchase wooden panels, waterproof sealants and hardware. Depending on your specific needs, they might also charge you for gates or reinforcement bars. Generally, a basic gate costs about one-quarter more than an equivalent length of fencing. Professionals build other expenses into their prices, such as insurance premiums and commercial truck maintenance. 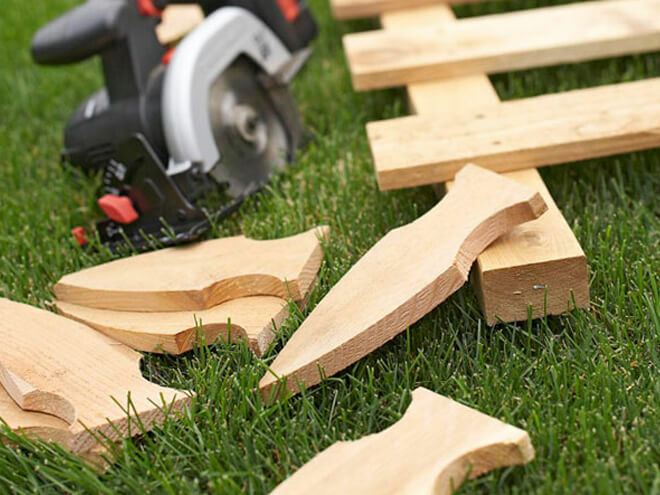 Wood fence installation is not simply a DIY task. Amateur work and low cost wood can easily reduce the lifespan of your fence leading to more costly damage repair. This project is usually handled by professional contractors with relevant training and the appropriate tools. Different styles, lengths, heights, and shapes can raise or lower the cost to install a wood fence. Decorative features frequently add to the price. You'll also pay more if your fence isn't a straight line, rectangle or square. Preassembled gates are less expensive than custom units. The specific species of tree used for your wood fence installation is important as well. For example, cedar costs up to 100% more than pine. Redwood has an attractive appearance but fetches even higher prices. You can save money by choosing a lower-grade wood from the same kind of tree. Few homeowners spend less than $1,000 when they hire contractors to install wooden fencing. This might be enough money to fund a relatively short pine fence. People pay an average of $2,500 total. You may spend this much if you want a fairly long cypress fence with multiple gates. It's possible that you'll be billed as much as $5,000. People often pay high amounts when they desire cedar or redwood fencing. The need to remove old fences, stumps or rocks will also boost the price up to a substantial degree. Various local factors should be taken into consideration as well. Wages, delivery costs, lumber expenses and permit fees vary from one state or city to the next. Your area's soil composition and terrain could also affect fencing installation rates. Some types of dirt necessitate taller posts and deeper holes. If you are considering wood fence installation, please key your zip code in the space provided. You can obtain precise local estimates from professional wood fence contractors. Compare prices so you get the best value for your money. It's completely FREE and you'll be under no obligation to buy a fence.